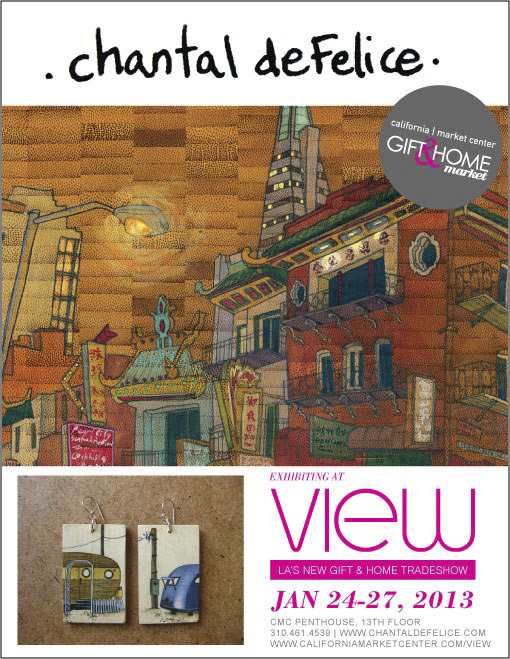 Yesterday, I began setting up my booth for VIEW : LA's New Gift & Home Tradeshow in the loft-style Penthouse level of the California Market Center, centered in the Fashion District in Downtown LA. I've exhibited there before for Unique LA, and love the space, with its giant windows around the whole perimeter offering what feels like a priveledged view of the city. Almost every show I've done in the past carried with it the nervous anticipation reminiscent of first day of school jitters- will I make friends? what will everyone think of me/my art? what should I wear?? ?- but finally, I'm starting to feel the confidence that comes with experience and taking your business or craft seriously. I feel prepared and excited because I know I will make friends, that at least a few people will like- and even love- my art ...and I have outfits planned and ironed for all four days of the show already. Ha! Another difference about this show is that it is open exclusively to qualified retailers, wholesale buyers & interior designers. This is new for me and I have no idea what to expect from customers that represent entire companies, but I'm open to the bigger opportunities that will hopefully arise from displaying my work in this context. I have in no way let go of my dedication to the ideals inherent in handmade, local production, but I am definitely ready to expand my retail exposure in order to sustain myself by making art for a living. Time for the next phase of evolution.